July 1946. 237 at the business session. The secretary's reading of the May and June meetings was read and approved after amending. The treasurer reported $45.01, and the report was accepted. Mrs. John Evans said the Congregational Church would publish and announcement of our meeting in the Church Greeting if the announcement is sent to the church office in time. The report of the nominating com. had to be changed because Mrs. Loose no longer lives in Grinnell, her husband having been transferred to a church elsewhere. 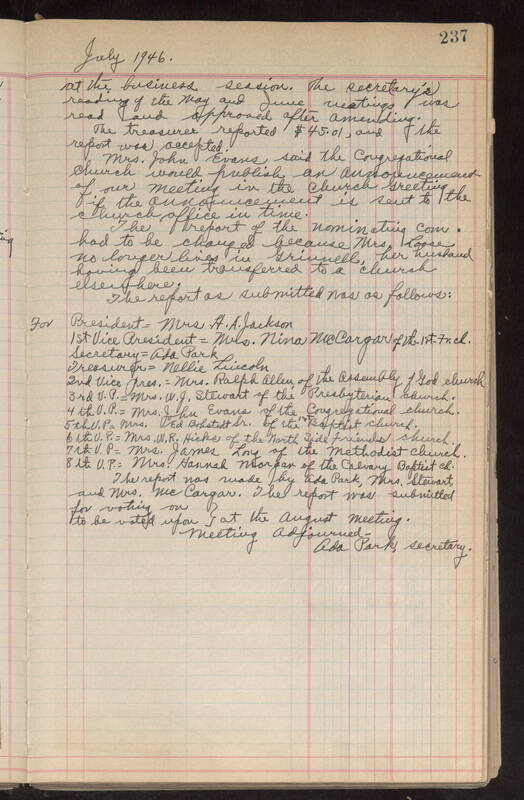 The report as submitted was as follows: For President = Mrs. H. A. Jackson 1st Vice President = Mrs. Nina McCargar of the 1st Fr. ch. Secretary = Ada Park Treasurer = Nellie Lincoln 2nd Vice Pres. = Mrs. Ralph Allen of the Assembly of God church 3rd V.P. = Mrs. W. J. Stewart of the Presbyterian church. 4th V. P. = Mrs. John Evans of the Congregational church. 5th V. P. = Mrs. Ed Bohstedt Sr. of the 1st Baptist church. 6th V. P. = Mrs. W. R. Hicks of the North Side Friends church. 7th V. P. = Mrs. James Lory of the Methodist church. 8th V. P. = Mrs. Hannah Morgan of the Calvary Baptist ch. The report was made by Ada Park, Mrs. Stewart, and Mrs. McCargar. The report was submitted for voting on/to be voted upon at the August meeting. Meeting adjourned. Ada Park, secretary.